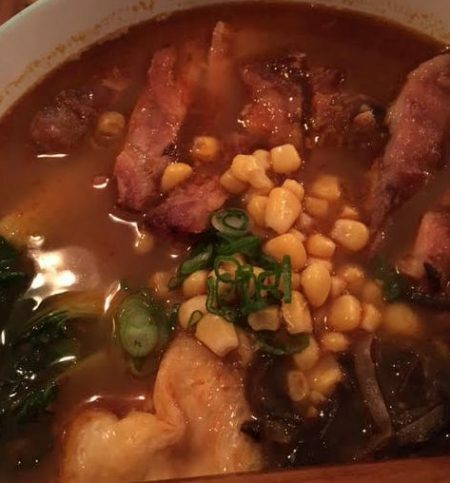 As a general rule of thumb, whenever a new ramen place opens up, I’m there within the first couple of weeks of it opening to cast my verdict. In the case of Meet and Treat Café, however, this didn’t happen. 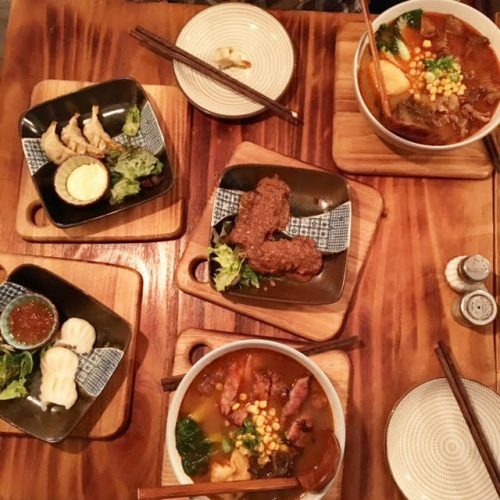 You see, I had absolutely no idea that this little cute café on Bath Lane was serving up some of the most delicious ramen bowls and dim sum in the city. I don’t think I’m alone there. 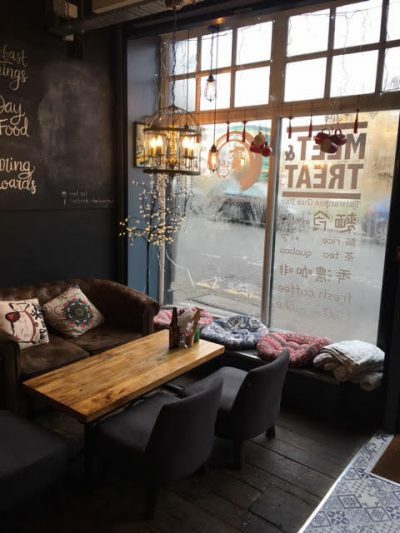 The name suggests a place to meet for a coffee and a cake with a mate, which is sort of true, but I was more than pleasantly surprised to find that Meet and Treat is much more than your average café. We visited a couple of weeks back on a Saturday afternoon to enjoy a late lunch and FINALLY get to see those amazing tiled floors I’d been seeing so much of on Instagram. The café is nicely styled and cosy, with plenty of decorative elements to catch the eye. We sat at the back and were given their pretty extensive menu and honestly, I was already TOO excited for what was in store. It’s true that Meet and Treat are serving up a variety of good food, but as an Asian food fanatic, I was way more invested in their dim sum and spicy bowls of ramen. As always, we went for a bunch of sharing dim sum to get us started, the chicken gyozas (£3.80), the chicken satay skewers (£3.90) and the prawn har kaw, aka little drops of dim sum heaven, at a very reasonable £3.90. I noted across the board that the pricing is very conservative indeed. For example, if we headed to the likes of Wagamama, you’re looking at £5+ for a small plate. 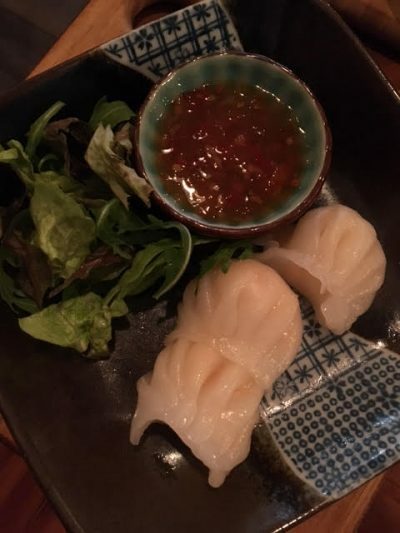 The quality and flavours were incredible, with a spicy peanut sauce slathered all over succulent chicken, prawn dumplings packed with fresh prawn paired with sweet chilli dipping sauce and crispy gyozas jammed full of tasty chicken. The dishes might be a little cheaper than your high-street restaurant equivalent, but these freshly made treats do not lack in flavour whatsoever. 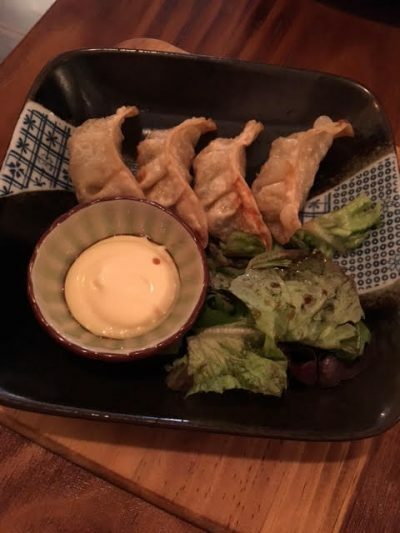 My only criticism is that you only get 3 of the prawn dumplings, so if it’s a case of adding a little extra cost for a fourth, I’d recommend they do. It would make sharing them far easier. For main course, I went for the Thai-style Spicy Chicken noodle bowl (only £7.80! ), while Tom opted for the Spicy Beef Noodles (same price), as we were both keen to get our spicy ramen fix. 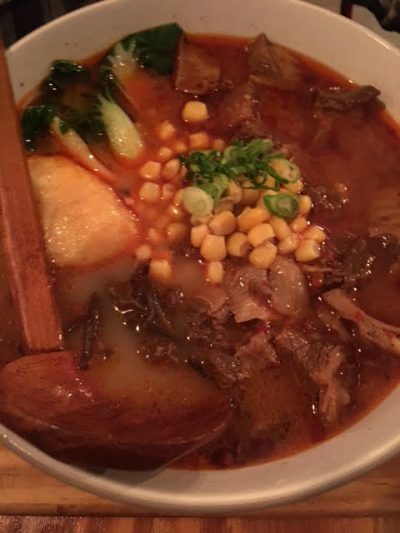 They arrived steaming hot around 10 minutes later, boasting plenty of chicken/beef and served in the normal ramen bowl with traditional ladle. I couldn’t wait to tuck in. The aromatic scent of lemongrass was evident after only a whiff, but once I dug in, it was a flavour explosion! Chilli, ginger, lemongrass and garlic dominated the soup, which was served generously along with perfectly cooked ramen and chicken. There was plenty of nutritious veg like pak choi, sweetcorn and cabbage. There was also a little weird egg thing, which I wasn’t so keen on, so that was ditched to the side in favour of those insanely addictive noodles and zesty soup. Again, the price to quality ratio was amazing – I still can’t get over the fact that these bowls of deliciousness were less than £8 each! It makes it even harder not to pop in there for lunch every single day. Tom’s beef noodle bowl wasn’t quite as successfully executed as my dish, with beef that was a little on the fatty side, but the rest of the arrangement was much the same and he saw to the lot. The soup, also, was a little oilier than the Thai-style Chicken noodle bowl, so it was no surprise that on our next visit, he chose differently and went for the winner. And on the note of the next visit, it just so happened that we spent the next couple of days fantasising about how good the food had been on our Saturday visit and made a wildcard second visit after work a mere 3 days later to take my brother and his girlfriend. 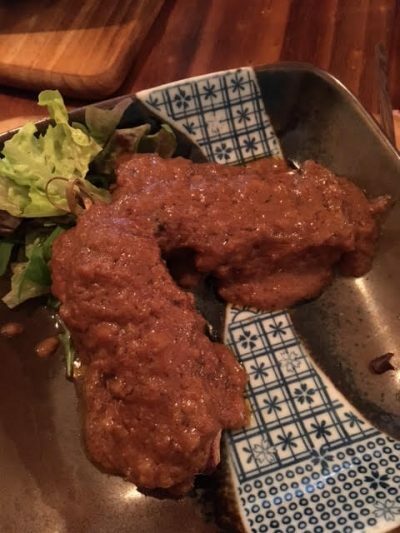 We’d been so wax lyrical about the place that they couldn’t wait to try everything we’d ordered, and both were very impressed. 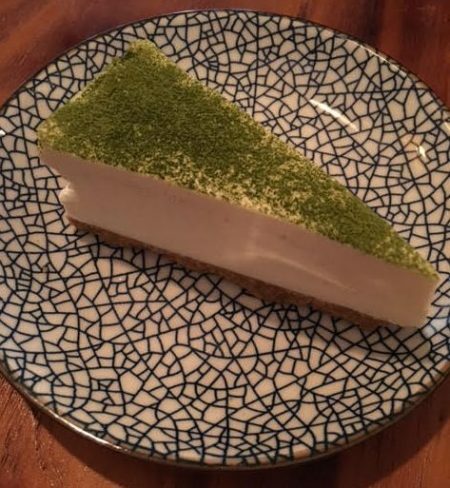 There was almost no room for dessert, but since Meet and Treat have garnered some fame for their selection of desserts and milkshakes, we decided to share a slice of Matcha cheesecake, which was velvety, creamy and dusted with matcha powder. I’m not sure what matcha is supposed to taste like, given I’ve only ever had it in green tea, but the cake was really tasty. It just seemed to taste like regular cheesecake to me. On our second visit, we ordered the exact same of everything (creatures of habit, I’m afraid!) and were equally delighted with our food. Since going to Meet and Treat, I’ve told anyone who’ll listen that it’s up there with Osaka‘s delicious noodle bowls in terms of flavour, and they’re considerably cheaper. 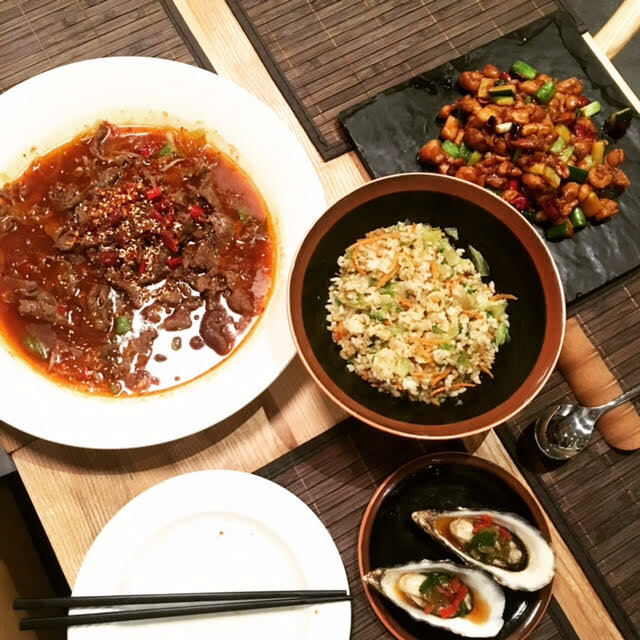 If you’re looking for tasty Asian food that doesn’t break the bank, this is your place. There’s more than just ramen bowls, too, and on our second visit, Danielle had opted for a delicious bowl of chicken Teriyaki donburi (£7.80) which was delicious. 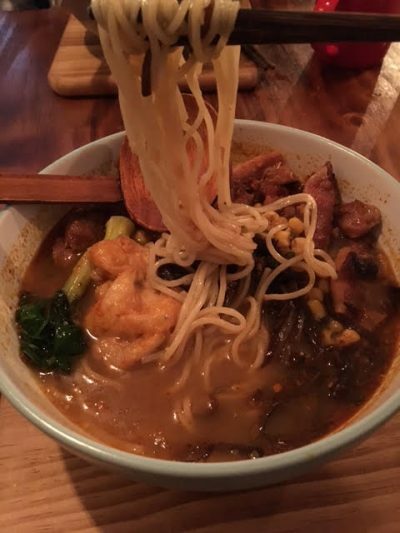 Maybe not as delicious as our Thai ramen bowls (not to go on about those again! ), but you can’t have everything. They also do wraps, salads, bao (steamed buns, which I’ll be opting for next time!) and plenty of hot drinks to tickle whatever takes your fancy. In addition to this, they do some pretty sweet breakfasts. I’ve seen plenty of pictures across Instagram of pretty plates of Eggs Benedict, served with either parma ham (traditional) or salmon (royale), or with smashed avocado and sunblushed tomatoes, all priced at around the £6 mark. If I ever get up early enough on a weekend to enjoy breakfast out, I’ll be going here without a doubt. Service is friendly and efficient and on both visits, other diners were well attended to and guided through Meet and Treat’s very extensive menu. Nothing was too much trouble and I really felt that the owners have tried to create an experience for diners. Tables have pots with little moustaches and glasses on sticks, and there are cute little touches wherever you look, like chalk messages on the walls and quirky ornaments dotted about the place to add more character. I think it says a lot that I managed to visit the same restaurant twice within three days and order the exact same thing, and I still want more. 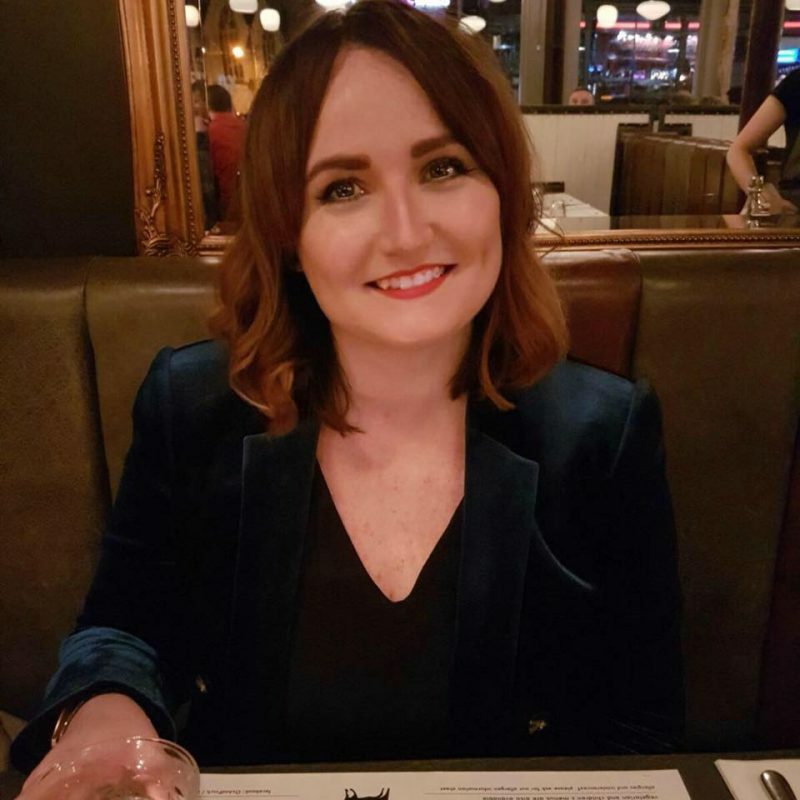 Meet and Treat is actually the perfect place to spend an afternoon with loved ones or friends – there’s something to suit everyone and it’s a really nice environment, with plenty going on and lots of comfortable areas to kick back and relax in. One day soon I shall take my laptop there and spend a day working whilst eating numerous plates of dim sum, steamed buns and ramen bowls. I already can’t wait. You can find Meet and Treat Café at 41 Bath Lane (near Hana Hana! ), Newcastle upon Tyne, NE4 5SP. There’s no website, but you can check out their Facebook page for visit inspiration and more info on their opening hours. We enjoyed complimentary food on our first visit and all food and drink was paid for on our second visit. As ever, all views are true to experience and all images are my own. Big thanks to Sandra Tang for introducing me to this gem of a spot, and the team and Meet and Treat for our two great experiences! 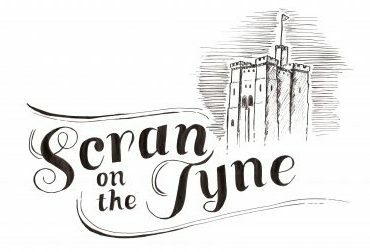 Next Post The Alchemist Newcastle: It’s finally here!